Thompson Square's artist Jane Bennett follows in the footsteps of other fine artists who have found Thompson Square and its environs captivating both for its heritage and aesthetic values. 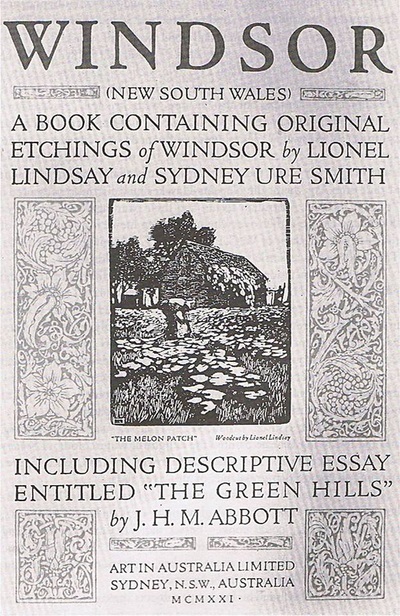 In 1921, he and his fellow artist, Sydney Ure Smith published a very special book called “Windsor NSW”. It contained a descriptive essay by the historian J.H.M. Abbott and was illustrated with etchings and woodcuts by the two artists. It has been called one of the most perfect books of its kind issued in Australia and as only 15 copies were made, one of the rarest. And so we can see what Lionel was doing in his visit/s to Windsor. 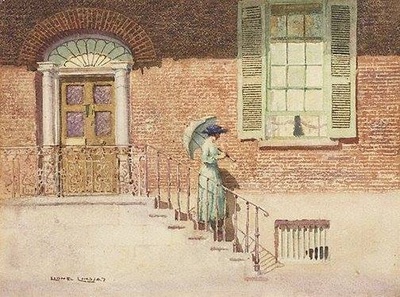 There are wonderfully descriptive etchings created from images made in Thompson Square of the Royal Hotel and the Doctor’s House. The Royal is depicted with energy and movement being implied by a swirling, cloudy sky....of which the horses and rider appear unaware as they plod their weary way up the incline towards the Hotel. The Doctor’s House is refined and almost Classical in its approach.....the watercolour version is full of sunlight and the whole image is given life by the figure of a young woman descending the stairs. From the Square, Lionel must have made his way to the Peninsular to record Old Government House and then perhaps walked on to the Armstrong farm to make “The Pumpkin Patch”. He must have then taken a walk to the bridge from where he gazed out over the fine view and made some peaceful images of the River and its banks. He was also fascinated by the huge and sometimes gaunt geometric shapes that rose in vertical contrast from the horizontal flats of the Hawkesbury flood plain and imposed their presence upon the blue summer skies. 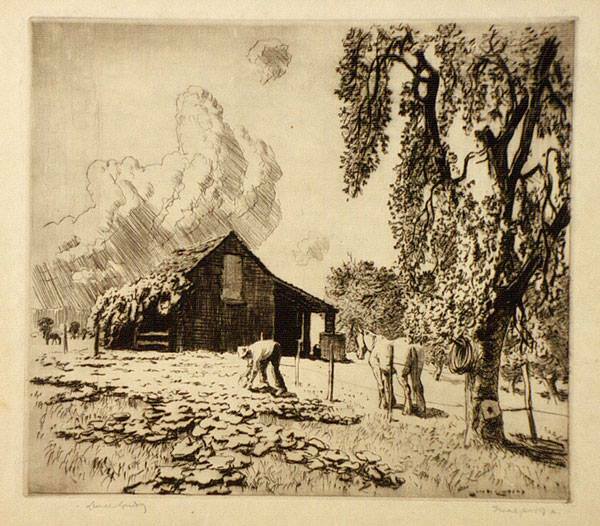 The barns of the Hawkesbury appear often in Lionel’s emotive etchings and woodcuts of the Hawkesbury. Lionel Lindsay and his family had some further attachment to the Hawkesbury via his daughter, Jean. She is mentioned in the Gazette, 1923, as attending a Gala Jazz Dance – the Hawkesbury College Diploma Dance with, among others, a Miss Nell Charley, from Belmont Park, Richmond. We next hear that Jean is staying in Monaco with her mother in 1927 and is preparing a trousseau for her coming marriage ( to be held in Colombo) next year to Mr Bob Charley, son of Major Philip Charley of Belmont Park. Lionel was a brother of the famous Norman Lindsay whose dedicated Gallery can be visited at Springwood. 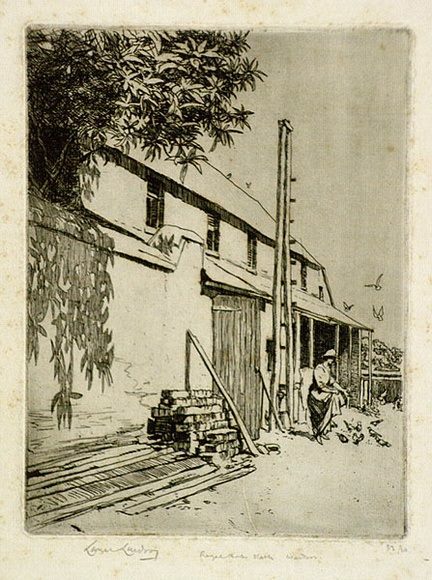 A Gallery dedicated to Lionel Lindsay can be found in Toowoomba, Qld. 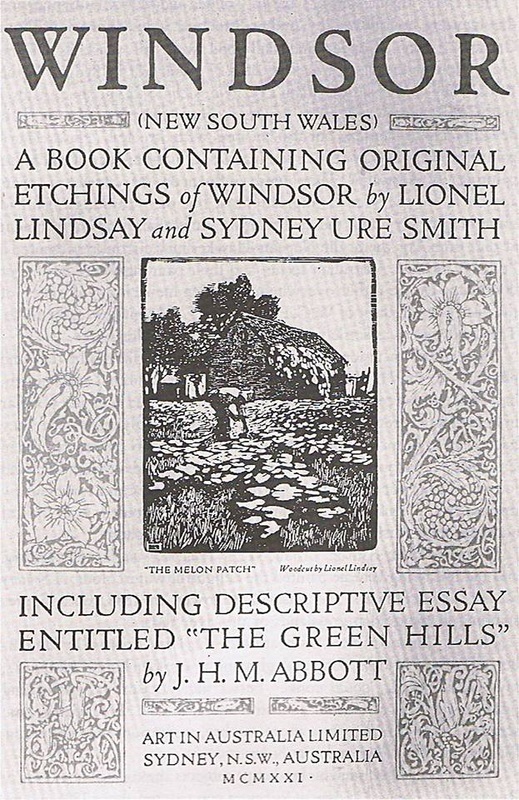 Lionel Lindsay was one of our Nation’s most accomplished etchers and woodcut printers. He also excelled in the media of watercolour and oil paint.